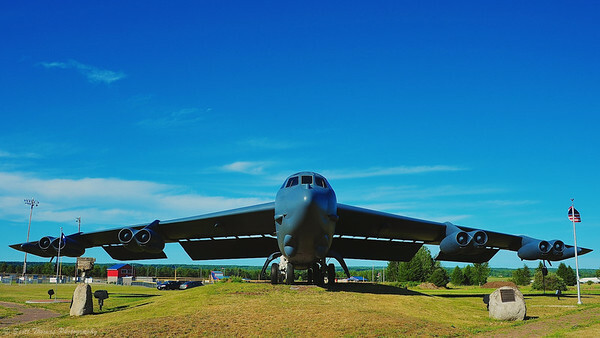 The B-52G Mohawk Valley on display outside the Griffiss Technology Park, the site of the former Griffiss Air Force Base, in Rome, New York. Nikon D700/28-300VR, 1/400s, f/10, ISO 200, EV 0, 28mm focal length. The Mohawk Valley was a B-52G Stratofortress long range bomber which last flew out of the Griffiss Air Force Base (AFB) outside of Rome, New York. Its last missions were flown during Desert Storm over Iraq in support of the international coalition. It would take off with a crew of 6 from Griffiss AFB and return 24 hours later after delivering its ordnances where it would be maintained, reloaded and sent back out with a new crew and mission. The aircraft is big (notice the vehicles under the wing on the left side) with a wingspan measuring 185 feet (56.4 meters) and fuselage of 159 feet (45 meters). Stratofortresses can carry approximately 70,000 pounds (31,500 kilograms) of bombs, mines and cruise missiles. The base was closed in the mid-1990’s and is now the Griffiss Technology Park as the area does its best to recover from the economic impact of the loss of the base. The Mohawk Valley is a monument to the men and women who for over 60 years looked over our country’s airspace and protected us from harm. This entry was posted in Travel and tagged 28-300mm, air force base, aircraft, b-52g, bomber, desert storm, griffiss, iraq, mohawk valley, new york, nikon D700, plane, rome, stratofortress, technology park, vr. Bookmark the permalink. Nice pic Scott. Now you are really in my back yard. I live just outside of Rome, less than ten minutes from this spot. Hi, Mike! Following you now on Twitter. Already got you covered on Google+. When I was photographing a baseball tournament earlier this summer, I drove past this plane and knew I had to photograph it. It is very BIG! The other artifact at the same location as the plane is a cruise missile. I’ve tried to capture both in a single shot but my point-n-shoot doesn’t leave me a lot of options. I’m also trying to get a pic of a C-5 Galaxy. Every so often there are training runs of touch-n-goes and you can sit at the end of the runway on the back side of the field as it takes off. It seems I’m never in the right place to catch it… lol. A C-5 doing touches would be fun to watch. I do have a photo of the cruise missile with the Mohawk Valley in the background. I’ll add them to this post later tonight. The giant bomber is at the same time great and beautiful – and also frightening and scary with all his strength and explosive force of bombs. Impressive photo! Wow, Scott, that beast IS impressive! I like the low angle of the shot as well as the inclusion of the American flag.